Amazing Desk Made from a 3D Printed Map of Manhattan #3DThursday #3DPrinting « Adafruit Industries – Makers, hackers, artists, designers and engineers! As a resident of New York City since he was in his teens, artist Troy Huang couldn’t help be be inspired by his adopted home. It was while he was working his way through design school that he came up with his idea for a stunning piece of furniture that would capture the essence of the city, and help him get to know every inch of it at the same time. 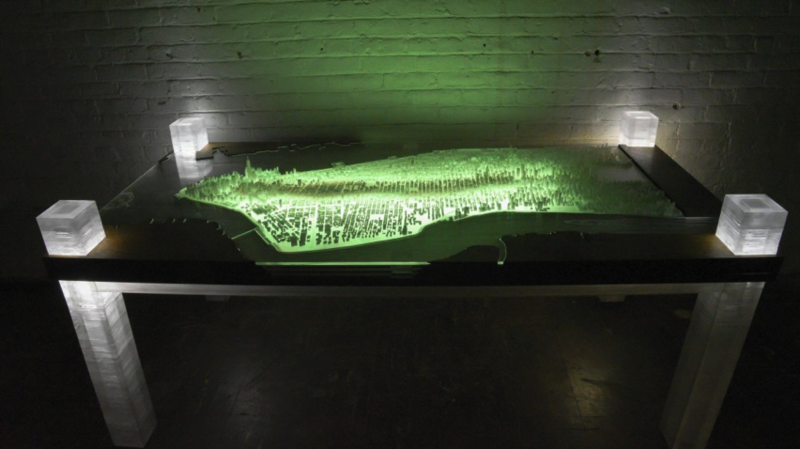 His “New York City” project is a scale replica of Manhattan that contains every building, street and landmark that the borough features integrated into a 3D printed and LED lit desk. While creating his amazing desk, Huang visited every block of the city, got to know what its purpose was, and tried to learn the history of all of the buildings. His detailed recreation of the city makes for quite the stunning tribute to one of the greatest cities in the world.